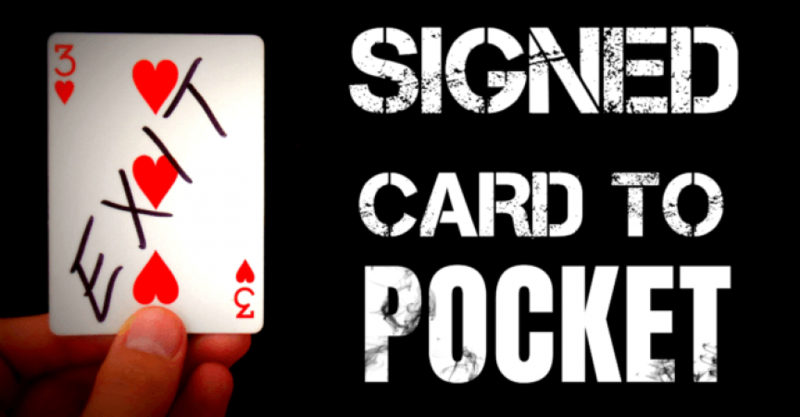 This is A great little card trick that is based entirely on your sleight of hand skills. The Spectator chooses any card in the deck and signs it. You then place it at the center of the deck. Instantly, you reach into your coat pocket to show the signed card. You then place it back into your jacket pocket, and then open the deck of cards. There in the middle, is the signed card again. You Don't need to have a pen to do this trick. It just Adds to the effect because there may be no speculation of a copy card and forcing the one on the audiences. Let's Take a look at the card trick being done, and the revealed tutorial below first. The first part is hiding the card. You’re only pretending to put the card into the middle of the deck. The card actually hides in your right hand. And it stays there as you pretend to put it into your jacket and take out the card. The trick can actually end right after you take it out from your jacket and it would still amaze the crowd. However, making it appear back in the middle of the deck just makes it more amazing. When you put it back into your jacket, again, you’re secretly putting it back into the hand holding the cards without the spectators knowing. The effect of this trick has a lot to do with how you act and perform during it. You have be extremely smooth in your movements so don’t attempt this trick until you are completely confident with every step. Once you’re done, this is a magic trick that can be performed anywhere and can amaze even the toughest crowds.